No doubt about it, the iPhone has changed everything right down to how we wake up in the morning. The old fashion alarm clock, once ruler of the bedside table, has been dethroned. While the team at Distil Union is all for technological advancements, they missed being able to haphazardly slap a big ol’ snooze bar to get a few more minutes of shut eye. With the invention of The Snooze Alarm Dock (The Snooze, for short), the founders of Distil Union, Nate, Lindsay, and Adam, have figured out how to bring the one thing they missed about their old morning routine back to life. This slap-happy snoozer for the iPhone is more than just satisfying. It’s Made in the USA and beautifully crafted from maple wood. 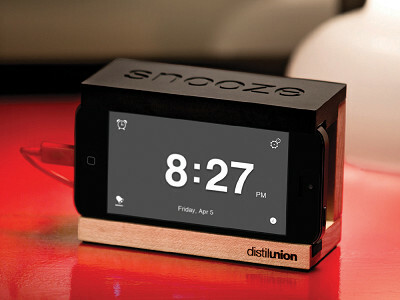 The Snooze creates a neat and tidy home on your nightstand for your iPhone and cable. The dock can even accommodate various iPhone cases. The bar can be used to not only silence your alarm, but also to quiet incoming calls. Things change. But some things should stay the same. The power to hit snooze without opening your eyes is one of them. Hello, everybody! All three of us -- Nate, Lindsay and Adam -- are here to chat with you today about Snooze, which is the first product we created as Distil Union. We have a combined 15 years of design experience, and now we're pouring our passion into creating products to make your life (and ours) a little better. Do you have to actually slap the snooze button? Or does it function more by contact and pressure? @Sara Hi Sara, Aaron from The Grommet here. You don't actually have to slap the snooze button, you can simply push firmly on it for the same effect. This alarm just works with the iPhone's alarm? So it can't be set to wake you up to the radio? @Guest Hi Guest, it will work with the native iPhone alarm but we also developed a free Snooze alarm app for enhanced functionality and to have a clock display. Future updates of the app will allow you choose your wake-up song and we are looking into the radio feature as well. Does the clock display go dark or stay bright, can the brightness be adjusted? @Jackie Hi Jackie -- to keep the clock from glowing all night, our Snooze App display can be easily dimmed or brightened by swiping your screen to the left or right! Snooze App is free on the app store, just search for "Snooze Alarm App"
@JEROME That's our app, developed to give you the complete Snoozexperience! It's free on the app store, just search for "Snooze Alarm App"
I have a case around my iphone will it fit in the snooze? @SANDRA Hi Sandra. Snooze will work with a wide range of cases but some may not fit. To ensure compatibility, the overall dimensions of your iPhone (5, 4S, 4) with case when measured in the landscape orientation shouldn't exceed an overall height of 2.5in (63.5mm) and a thickness of .55in (14mm). Does it come with a charging cord so the phone can be charging overnight? @Kathleen You got it, Snooze doesn't come with a cable, but you should use your cable and plug in your iPhone overnight if you're going to be running it as a clock. Only iPhones?? Is there one for Droid users? @Deonne Only iPhone 4/4S and iPhone 5 at this time. Nothing against Droids though! Does it fit the dock if you have one of those thick rubber protective cover? @Rosie Hi Rosie, there are literally tens of thousands of protective cases on the market so it is hard to say without more detail. Snooze will work with a wide range of cases but some may not fit. To ensure compatibility, the overall dimensions of your iPhone (5, 4S, 4) with case when measured in the landscape orientation shouldn't exceed an overall height of 2.5in (63.5mm) and a thickness of .55in (14mm). Hope that helps. It depends on the dimensions, but you can find the information under the details of the product page. Here are the specifics for your reference: The dock can accommodate various iPhone cases, but the overall width needs to be less then 2.5 in. / 63.5 mm, depth needs to be less then 0.55 in. / 14 mm. Will an Otter Box fit in the Snooze Alarm Dock? I have the iPhone case that is sold on Grommet (with credit card/mirror on back). Will that work with your product? Thanks! No doubt about it, the iPhone has changed everything right down to how we wake up in the morning. The old fashion alarm clock, once ruler of the bedside table, has been dethroned. While the team at Distil Union is all for technological advancements, they missed being able to haphazardly slap a big ol’ snooze bar to get a few more minutes of shut eye. 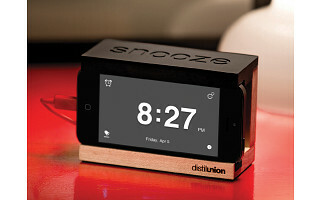 With the invention of The Snooze Alarm Dock (The Snooze, for short), the founders of Distil Union, Nate, Lindsay, and Adam, have figured out how to bring the one thing they missed about their old morning routine back to life. This slap-happy snoozer for the iPhone is more than just satisfying. It’s Made in the USA and beautifully crafted from maple wood. The Snooze creates a neat and tidy home on your nightstand for your iPhone and cable. The dock can even accommodate various iPhone cases. The bar can be used to not only silence your alarm, but also to quiet incoming calls.